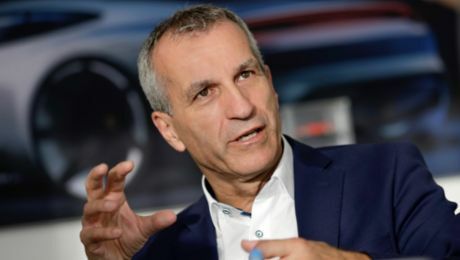 Albrecht Reimold is the new Member of the Executive Board for Production and Logistics at Porsche. Today he takes up his position in Zuffenhausen. A portrait. Albrecht Reimold's first contact with Porsche was decades ago. “As a small boy, a model Porsche was the first car I held in my hand”, says the 54-year-old, who moved into his office in Stuttgart-Zuffenhausen on 1 February as the new Member of the Executive Board for Production and Logistics. Together with his father, who was an engineer, the scale model 911 certainly made a decisive contribution to his automotive career. After studying production technology at the university of applied sciences Heilbronn and training as a specialist welding engineer, Albrecht Reimold started work as a trainee at Audi in Neckarsulm. He held several leadership positions during his long career at the sister company, gained international experience in China and India and finally in 2009 took over plant management at the Neckarsulm site. In 2012 he was appointed Chairman of the Executive Board at Volkswagen Slovakia in Bratislava. It was here that he came into contact with a Porsche model for a second time, this time full scale. Because the body of the Porsche Cayenne is manufactured in Bratislava. Albrecht Reimold discusses links between the past and future at Porsche, as well as his passion for the 911. An interview with member of the Executive Board for Production Albrecht Reimold.